Arias-Cartin R, Grimaldi S, Arnoux P, Guigliarelli B, Magalon A.
Biochim Biophys Acta. 2012 Oct;1817(10):1937-49. doi: 10.1016/j.bbabio.2012.04.005. Epub 2012 Apr 17. The structural and functional integrity of biological membranes is vital to life. The interplay of lipids and membrane proteins is crucial for numerous fundamental processes ranging from respiration, photosynthesis, signal transduction, solute transport to motility. Evidence is accumulating that specific lipids play important roles in membrane proteins, but how specific lipids interact with and enable membrane proteins to achieve their full functionality remains unclear. 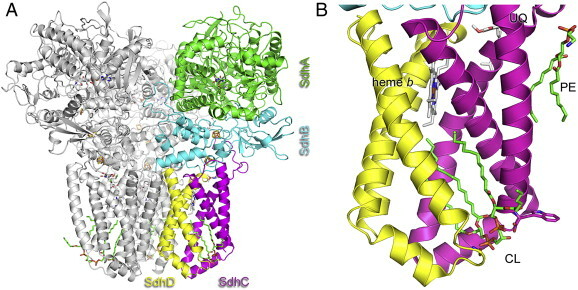 X-ray structures of membrane proteins have revealed tight and specific binding of lipids. For instance, cardiolipin, an anionic phospholipid, has been found to be associated to a number of eukaryotic and prokaryotic respiratory complexes. Moreover, polar and septal accumulation of cardiolipin in a number of prokaryotes may ensure proper spatial segregation and/or activity of proteins. In this review, we describe current knowledge of the functions associated with cardiolipin binding to respiratory complexes in prokaryotes as a frame to discuss how specific lipid binding may tune their reactivity towards quinone and participate to supercomplex formation of both aerobic and anaerobic respiratory chains. This article is part of a Special Issue entitled: 17th European Bioenergetics Conference (EBEC 2012).